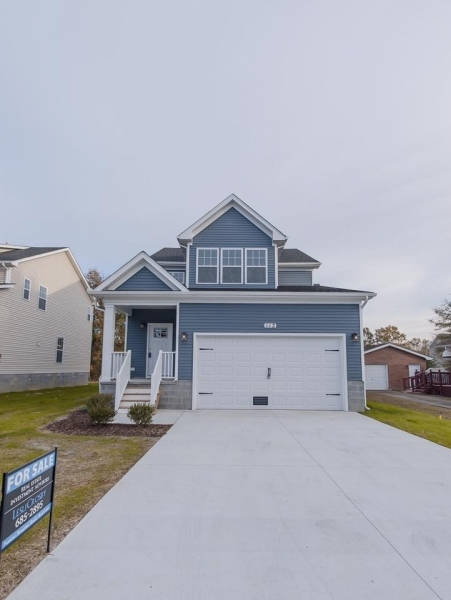 Gorgeous new construction ready to go in Great Bridge High District! Full of amazing upgrades including wide plank grey wood floors throughout the first floor living spaces, white coastal cabinetry with soft close hinges and doors, upgraded granite countertops with large island and pantry in the kitchen. Huuuge master suite with tray ceiling and walk in closet. Laundry upstairs by bedrooms! First floor bedroom and full bath as well! Full stainless steel appliance package including side by side fridge! Large backyard with privacy fence installed. Come grab it now! The information on this website is deemed to be accurate but not warranted. Minor room size variations and reversed floorplans are subject of field conditions. Prices and specifications are based on the latest possible information available at time of publication approval. Renderings or floor plans depicted may show additional options. Builder reserves the right to make changes at any time without notice in specifications, prices, material, colors, equipment and models. Contact agent for each community regarding current pricing and standard feature updates for each home plan. We want to hear from you. Use this form to request more information or just drop us a note. Please send me more information about 112 Jones St in Crestwood.